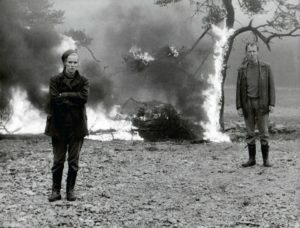 Ingmar Bergman‘s films are not generally thought of among war films: couples down and apart, landscapes severe and forbidding, as are the moral dilemmas he portrays. However, Shame, 1968, re-titled from its initial War, is a war film unlike any other. Living quietly on a rural island husband and wife, Jan and Ana Rosenberg (Max von Sydow and Liv Ullmann, have both moved from symphony orchestra playing to life in the country. A war breaks out. Jet fighters scream over head. Bombs explode. The actual enemies are a bit murky though we assume it’s an imagined civil war in Sweden, with rebels, partisans and regular army. The superior force, at least in their small geography, takes the couple in, along with others, for questioning. Beatings are applied. Lies are told. I’ve not seen a film where the surprise and fear at being rounded up for unknown purposes by brutal men, is made more clear. No fancy lighting, No color to prettify. Soldier: Where do you belong? Whose side are you on? Jan: I don’t belong anywhere. We’re musicians. Soldier: You were musicians. There aren’t any orchestras any more. And because it’s Bergman, with his two mainstays Ullman and von Sydow, the grimness, the terror does not bring them together but drives them apart. The war on the outside becomes the war between, and the war within. The meek Jan becomes a killer, the strong Ana, loses her strength and follows, unable to cope. And of course, seeing it today, in 2018, 50 years after its release met with much controversy, brings us to think about many more wars, and the impact on human emotions, than that in Vietnam, opposition to which was becoming international at the time of the film’s release. At initial release many critics disagreed with Bergman’s later assessment, reviewing it quite favorably: Robin Wood, Bergman’s first English monographer, even claimed that it was the “director’s masterpiece.” Others, notably well-known Swedish academic and writer Sara Lidman charged Bergman, by not taking sides, not signalling the good-guys and the bad-guys, with creating propaganda for the American government and the war in Vietnam. Although Bergman had shockingly used a film image of Thích Quảng Đức as he burned to death in protest of South Vietnam’s treatment of Buddhists, in his just previous film, Persona, he was held to be too aloof, too unengaged in the moral questions of that decade. For a later summary and view of the atmosphere and charges see Eric Hedling’s extensive remarks in 2008. I find the charges and defenses very interesting, however, seeing the film today, outside of the rage about that war, it is hard to see it other than as Bergman intended: a bleak look at all war, any war, and what happens to those struck by it. Liv Ullman, of course, is worth the watching, always. Her expressive range never fails. The von Sydow seen here is not the one we might expect from his other characters in Persona (1966), Hour of the Wolf (1968), The Passion of Anna, (1969) and many others. For other reviews and commentary on Shame, see the Ingmar Bergman memorial site, Roger Ebert, Renata Adler at the NYT, & Can’t Stop the Movies.